Within the shallow, almost claustrophobic space of this miniature, Judas betrays Jesus with a kiss, a pre-arranged signal that alerts the Roman soldiers to Jesus' identity. On the left, the apostle Peter raises his sword to cut off the Roman soldier Malchus's ear. Clad in bright green, this small figure falls awkwardly to the ground before Jesus. On the right, soldiers muscle in to arrest Jesus. Pushing, gesturing soldiers on one side and Peter's upraised sword on the other overlap the image's frame. The artist crowded the composition in this way to heighten the scene's emotion and tension. 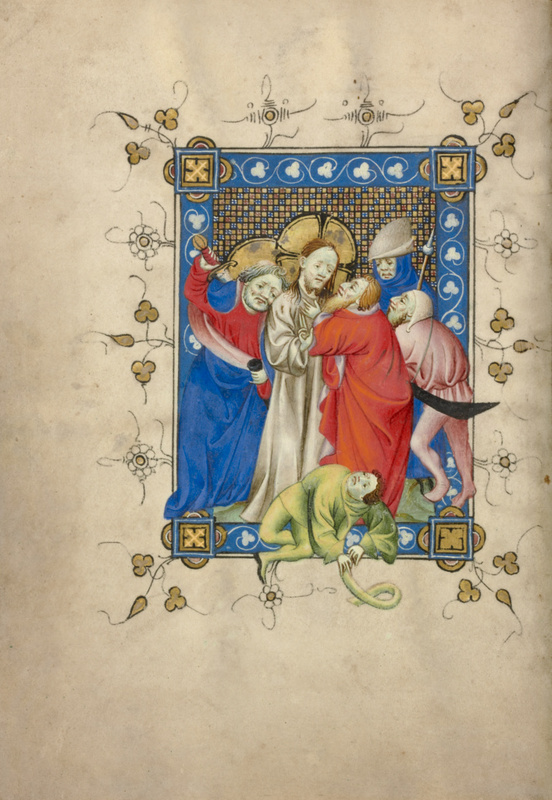 Collapsed at the miniature's bottom edge, the figure of Malchus plays an important role, extending the pictorial space into the unpainted margin and drawing the viewer into the painting in this tiny book.